Monday September 15th 1924 Was busy in my room in AM. Rode to town with Ott after dinner. Went up to Hatties. I made my silk bag. Cora brought me home after supper. Had letter from Birdie and wrote Laura Mason. It is 40 years today since brother Rob died. Tuesday September 16th 1924 I went to town in The Bus and called on Rev Keeler to get my church letter for The Presbyterian church. I then selected a hat and got a pair of shoes. Went back to town in PM to take a treatment of Dr Stryker. Called at Jennie Sterritts. Ott went away this evening. Hattie spent evening here. Wednesday September 17th 1924 I rode to town with Fannie and got my hat. After dinner I walked over to The Presbyterian Church and back. I went to help do things for Mission work. Called at Mrs Broadways. Ott home tonight. Fine day. 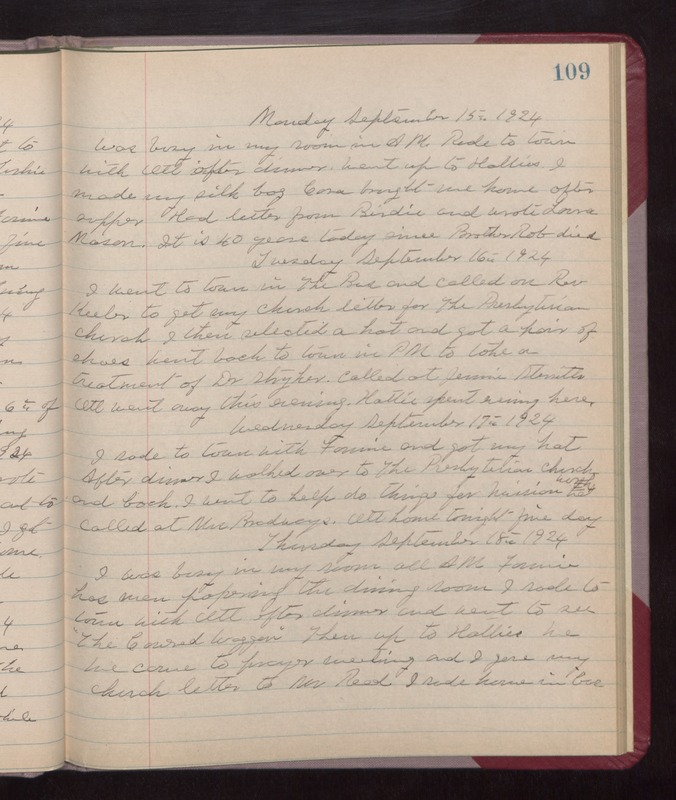 Thursday September 18th 1924 I was busy in my room all AM. Fannie has men papering the dining room. I rode to town with Ott after dinner and went to see "The Covered Waggon." Then up to Hatties. We We came to prayer meeting and I gave my church letter to Mr Reed. I rode home in bus.